Pads and sidewalks: First, remove grass and topsoil. If area is not well drained a base of compacted pea stone, recycled process, or trap rock is recommended. This will help prevent water from washing out the base or freezing and heaving the concrete. Using 2″x4″‘s or 2″x6″‘s frame out the area. Level the forms and steak the outside of the forms to secure them. Measure and cut a board to “Screed” the concrete after pouring it. Make sure you have the correct concrete tools for your particular job. Using the correct finishing tools is essential to ensure a quality project. 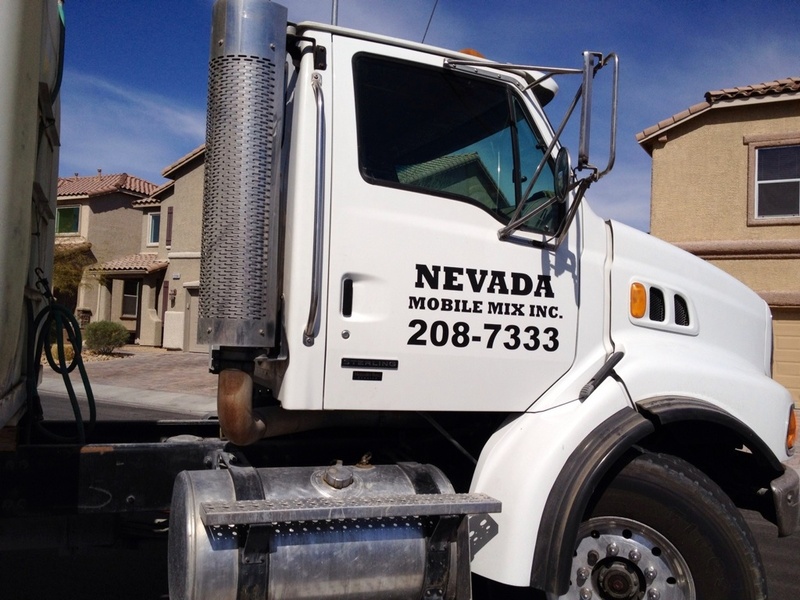 Call Nevada Mobile Mix, Inc. at 702-208-7333 to verify and order the amount of concrete that you need. Fill forms by direct delivery from our trucks. “Screed” the concrete. Screeding is the process of smoothing the concrete by using a 2×4 in a sawing motion over the concrete. This levels the concrete with the surrounding forms. It also recommended that the forms be gently tapped from the outside to eliminate any air pockets. “Float” the concrete to smooth out any remaining rough areas. Be careful not to “overwork” the concrete. At this time you can also edge the concrete with and edging tool. After all “bleed water” has evaporated from the surface, finish with a sharp edged “steel trowel”. This will produce a very smooth finish. A “broom finish” is recommended for areas that may get wet and slippery such as: sidewalks and pool decks. This is accomplished by dragging a broom across the concrete after using the “steel trowel” for the final time. A final pass with the edging tool will give the broom finish a clean cut off at the edges. The process of the concrete setting up is a chemical reaction not a “drying out” of the concrete. Water is an important part of this reaction. It is important that the concrete be kept moist especially in hot weather. Concrete that cures too fast may be weak which would cause it to flake, peel, or dust.